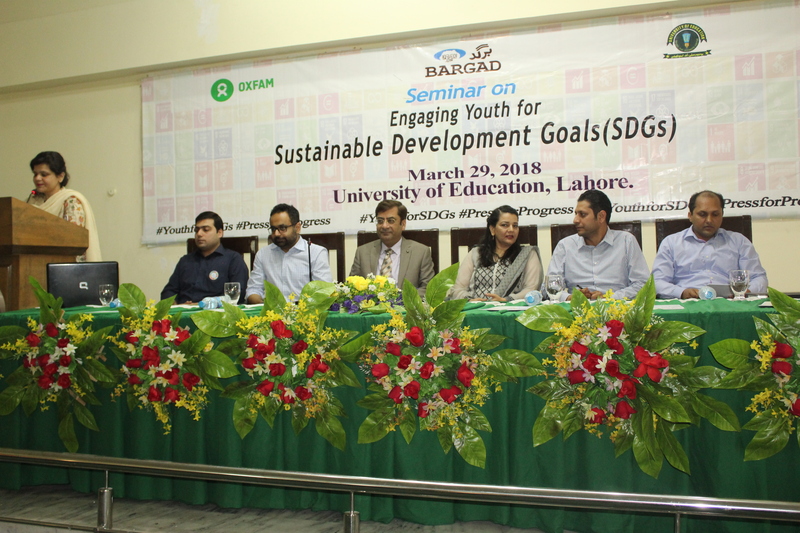 LAHORE: Bargad, a national level organisation working for youth development, in collaboration with University of Education (UE) Lahore and Oxfam Pakistan held a seminar on “Engaging Youth for Sustainable Development Goals (SDGs)”. 218 students participated in the seminar organised to provide orientation and awareness to youth about the SDGs specifically Pakistan’s context. The topics that were brought into discussion revolved around three SDGs, which were SDG 5 (Gender Equality), SDG 8 (Sustained, Inclusive and Sustainable Growth) and SDG 16 (Peace, Justice and Strong Institutions). The seminar was the last event as a part of Bargad and Oxfam’s nationwide campaign on SDGs in 12 universities all across Pakistan. UE Vice Chancellor Dr Raufe Azam gave his welcome note and the panelists of the seminar included UE Assistant Professor Dr Muhammad Naeem, UNDP Ali Zafar, Punjab Commission on Status of Women (PCSW) Salman Shahid, Researcher Dr Nauman Ali Ch and Punjab Department of Youth Affairs Deputy Secretary Tehmina Habib. Bargad Executive Director Sabiha Shaheen closed the seminar. Dr Raufe Azam appreciated the efforts of engaging students in promotion of SDGs. He spoke about the concept of sustainability and asked students to be critical thinkers. He said that students needed to think deeply about things and should evaluate on the basis of evidence and analysis rather than on assumptions and hearsay. Ali Zafar said that SDGs Support Unit had been established within the P&D department and was working on the district level in Punjab. “District SDGs Committees had also been constituted for leading work on SDGs implementation in the districts,” he said and added that young women were a development priority in Punjab. Dr Nauman Ali Chaudhry discussed mental health issues and stress factors upon students that impacted badly on their academic performance. Tehmina Habib shared about the progress of development work done by the youth affairs department under the framework of the Punjab Youth Policy 2012. UE student Ghumama Amjad said that young generations should be put on priority and given opportunities to contribute towards global problems’ solutions. The panel discussion was followed by a question and answer session with the students of UE. Bargad Executive Director Sabiha Shaheen closed the seminar and told that Bargad was not only involved in conducting these seminars, but was also very active on social media over the issue of SDGs. While the seminar was in progress, its hashtag #youthforSDGs ranked second in Pakistan on Twitter.